If you are in the mood for some fantastic food, drinks and service then you definitely want to check out the Brazilian Steakhouse at 920 Main Street in Wobourn, MA. While parking can be a little challenging, it is well worth the effort and make sure you are VERY hungry. My wife and I met two other couple friends of ours at the restaurant for our "Parent's Date Night". We get together about once a month to relax with friends, great food and drinks. We have gone to several different restaurants in the past ranging from Italian to Mexican but this was our first time going to the Brazilian Steakhouse and we will definitely be going back. My wife and I arrived first and on our way in, we happened to meet the Lincoln Fontes, the restaraunt manager. Since this was our first time visiting I asked Lincoln what he would recommend and he immediately said the Pre-Set Menu and he explained what it consisted of. This menu item is reasonably priced at $34 per adult ($16.95 per child) and consists of a salad to start off and then a side dish of Potato Puree, grilled asparagus with garlic and Parmesan cheese, Pico de Gallo salsa and Chef's beef fagioli and to top it off an ALL YOU CAN EAT lineup of some of the best cuts of meats that I've ever eaten. The really unique approach to this dinner is when the servers come to your table with meat on skewers and carve you a slice of the meat right there at the table. The night we went, there were 17, yes SEVENTEEN, different meats to sample from and everyone cooked to perfection by Executive Chef Alexandre Alvarenga and served with flare and enthusiasm by the ever helpful staff. It was a terrific experience and we all had a wonderful time. From the moment we walked in we were treated as old friends. We went to the bar to wait for the other couples and the bartender was very helpful and and Lincoln had a couple meat samples brought out for us to try and it was absolutely delicious. We pretty much closed the restaurant and never felt like we needed to hurry up and leave nearing closing time. All of the staff seemed genuinely happy and were quick witted with banter. By the end of the evening, we were all completely stuffed! I would definitely recommend this restaurant with the caveat to be sure and not eat all day before going so you can enjoy some of everything they have to offer. 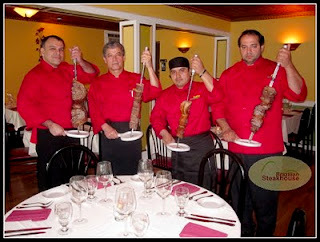 You can see their full menu at http://www.braziliansteakhouseboston.com.